Powered by Everything DiSC®, the profiles help participants understand their own DiSC® styles. This profile is management-specific helping participants to recognize and understand the styles of the people that they manage. Includes access to unlimited follow-up reports. 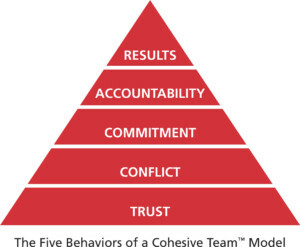 The program helps teams understand how, The Five Behaviors Model is used to help team members learn to work as a team, they score on the key components together more efficiently and effectively and become a more cohesive of The Five Behaviors model: trust, conflict, commitment, accountability, and results. Each individual on the team will also understand their own personality style and their team members styles, based on the DiSC® model: D: Dominance, i: Influence, S: Steadiness, and Conscientiousness, and how their style contributes to the team’s overall success. The program is designed exclusively for intact teams and work groups. The Five Behaviors of a Cohesive Team harnesses the power of Everything DiSC® and the clarity and simplicity of The Five Dysfunctions of a Team model.